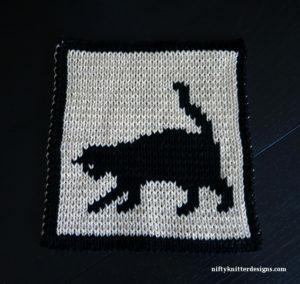 Decorate your kitchen with this cute potholder featuring a cat at play! Perfect for the cat lover. 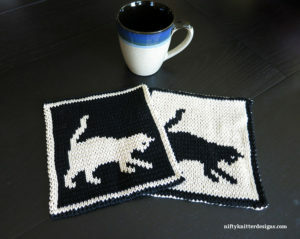 Double knit, the potholder is reversible, with opposite colors on the reverse side. Use color changing yarn for interesting color combinations or solid yarn for a more classic look. Full instructions are included for the double knitting technique. The finished size is approximately 7 inches by 7 inches (17.8 cm by 17.8 cm). Disclaimer: This pattern is for creating a decoration only. The knitted item might not protect you from hot items. Please use caution. 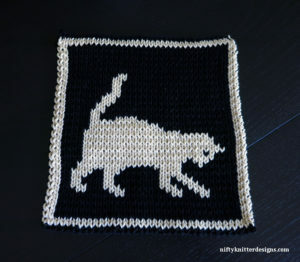 Approximately 50 yards (45.7 m) each of two contrasting colors of worsted weight yarn makes one potholder. Cotton works great for these.